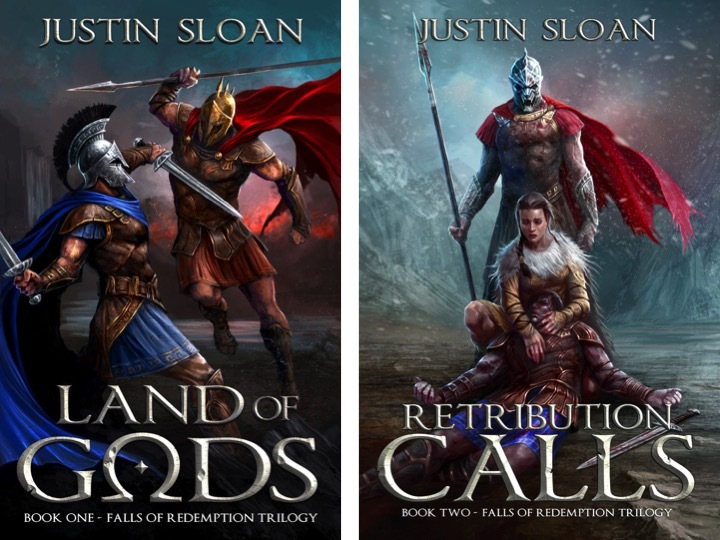 This is a sample chapter from Book 3 in the FALLS OF REDEMPTION epic fantasy trilogy. It is a draft, meaning it has not been edited or finalized. That said, I’m open to feedback! The man’s eyes opened, and he stared at the clouds floating across the sun that glimmered and wavered as if barely there. Yellow rays of light warmed the man’s skin, accompanied by a gentle breeze. A breath of fresh air alerted his senses, pulling him into the present, reminding him that he couldn’t lie there forever. For a moment, he wondered if he were in heaven, but a shooting pain in his back told him that thought was wrong. He sat up with the piercing question of who he was and why he was here. A glance at himself revealed tattered blue robes, and a sandal on his left foot but none on his right. He glanced at his surroundings, curious, hoping for a clue among the weeping willows that lined the reed-filled river, but found none. … sign up for my author mailing list for a free copy (along with other free books, audiobooks and updates). And the PRINT BOOK is live! So if you enjoyed these posts/the book, please go online and leave a review here. PLOT: Allie discovers that her new necklace and an unlikely friend are her keys to traveling across the world to save her mom from a cult and their otherworldly leader, and in the process learns that she has a greater destiny. Without further ado, let’s finish the book, Allie Strom and the Ring of Solomon. When the book goes live (November 15), it would be great if you have a review ready to go (hint hint). You can also pre-order book 2, Allie Strom and the Sword of the Spirit, which will go live mid-December (just in time for Christmas). 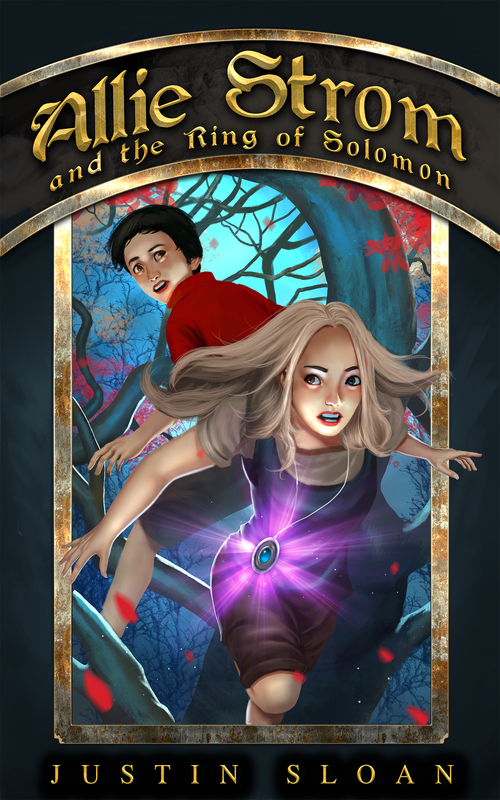 Without further ado, let’s dive into my MG novel, Allie Strom and the Ring of Solomon. Allie stirred, sure she had heard someone calling her name. She imagined opening her eyes to find herself on her bedroom floor, having fallen out of bed. But no, the smell of musty old books filled her nostrils, and then there was someone calling her again. “Allie,” Principal Eisner said, and Allie opened her eyes to see the principal’s warm face, her silver hair framing the deep lines around her eyes. Allie lifted her arm and desired the power again, the intense force that had shot at Paulette. All around her the rocks of the mountain seemed to fade into darkness, the sky smothered her in a thick black mist. The power came, coursing through her fingers to blast Paulette in the forehead. Instantly Allie felt her insides churn and found herself on the ground coughing up blood. She heard laughter and looked up to see Paulette’s face shadow over and her eyes turn a fiery red. Paulette turned toward the army and broke into a run. Allie stood, clutching her stomach. Blood dripped down her arm and chin. Paulette sprinted towards the giant, her hand held high, the ring between her forefinger and thumb. Then Allie saw another face she knew. Behind the giant Chris ran for Paulette, Allie’s necklace in his hands. He smiled wickedly. An aura glowed from the ring as the two drew close, surrounding the dark forces as if they all emanated from the ring. Something told Allie she could not let the ring and the necklace be united, not by those two. She looked around, instantly recognizing where she was. Before her stood the gold walls of Solomon’s throne, beyond the wall that had crumbled. She was back in Osh. Footsteps echoed from the rock tunnel behind the crumbled wall. Allie turned, looking for somewhere to hide. Ready for anything except, to her surprise, when Paulette poked her face through the opening, panting and sweating. Chris’s smiling face grew bright as the necklace’s glow increased, the blue mixing with the red of his eyes to form a purple that then formed shadows, reaching shadows, shadows that moved around the room as if attempting to escape the light. Allie turned to Daniel in horror and saw his eyes rolled back in his head. He fell, but before he hit the ground Chris lunged forward and the light flashed blindingly to fill the room. Allie blinked, trying to clear the light blotches visible in the dark room. Daniel rubbed his arms, as if to make sure his whole body had returned. Whatever had happened, Allie was more certain than ever that her necklace was the key to figuring everything out, and her mom hadn’t simply been on some development mission. “Did you get it?” Paulette asked. “What could my mom have been doing there?” Allie asked, ignoring Paulette’s question. A light shone, growing and pushing out slowly from Allie’s chest. It moved to her hand, pulsating as it sent tingles of warmth through her body. With a crack as if the air were a whip against the earth, the light expanded as far as the eye could see and then was gone, leaving the natural light of day. Allie followed Daniel into a small bedroom, tiptoeing so as not to wake his dad. A blue comforter lay tossed across the bed and video games were scattered across the floor. “Some place you have here,” she said. “Huh,” was all she could say to that. “So, no luck with your dad then?” he asked. Daniel leaned against his television stand and Allie noticed something behind him. “Is that a present?” she asked. He turned and sure enough, he picked up a small package in blue wrapping paper. Allie waited expectantly on the couch, rocking back and forth, the necklace held between her hands. She figured this was a talk better had between her and her dad. Daniel said he had plans anyway, so he headed home. What would her dad do when he found out? She imagined him jumping up and down for joy, like a child on Christmas morning. And then what? Somehow, he would know what to do. She was sure of it. Her dad came home later than usual, his eyes heavy and focused on the ground before him. In the entryway, he sighed and pulled out his phone, stared at it longingly, then looked up to Allie with a half-smile.